MARGINS Papua New Guinea (PNG) Focus Site activity map showing instrument and profile line locations. Sources: Basemap (bathymetry and rivers) and offshore cores – Driscoll (pers. comm.). 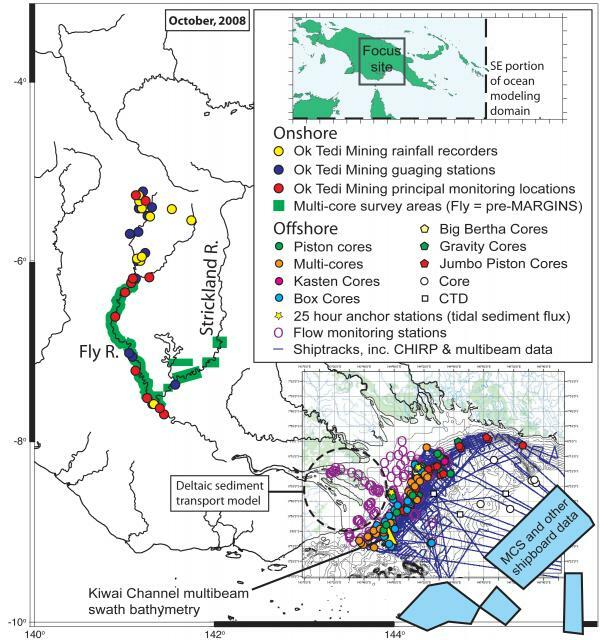 25 hour anchor stations (tidal sediment flux), flow monitoring stations, and Kiwai Channel multibeam bathymetry – Crocket et al, 2008 and MGDS. Multichannel seismics (MCS) and other shipboard data – Crockett, MARGINS Waipaoa Workshop, 2003; Driscoll (pers. comm. ); Milliman (pers. comm.) and MGDS. Ok Tedi Mining Ltd. rainfall recorders, guaging stations, and principal monitoring stations – MARGINS New Guinea/Northern Australia group. Multi-core onland survey areas – Aalto et al., 2008 and Dietrich, pers. com. 2005. Fly Delta sediment transfer model - Fagherazzi, pers. com., 2005. Ocean modeling domain - Slingerland pers. com., 2005. Suspended load and soil geochemistry sampling - Kurtz, pers. com., 2006.